A representative collection of artifacts discovered in July 2015. (a) one leg of a brass nautical divider for measuring distances on charts; (b) a copper ship’s nail; (c) a fishhook possibly made from a copper nail; (d) a brass or copper belt or strap buckle; (e) perforated sheet copper, possibly from hull sheathing; (f) perforated sheet copper, possibly from hull sheathing; (g) French gunflint; (h) French gunflint; (i) lead musket ball. Photos by Dave McMahan. Working closely with the U.S. Forest Service and the Sitka Tribe of Alaska, an international team of researchers funded by the National Science Foundation (NSF) has begun to piece together an archaeological and historical narrative of survival in the harsh subarctic winter by crewmembers of the 19th century Russian-American Company frigate Neva, which was wrecked near Sitka, Alaska, in 1813. The wreck of the Neva has been surrounded by stories and legends over the past two centuries. Although survivors eventually were rescued and taken to Sitka, few accounts of their experience were ever collected or published. No official records relating to the wreck and its aftermath have been discovered. The NSF-funded team’s mission is to verify the wreck location and confirm the survivor’s camp. Researchers also hope that Tlingit oral history will add to the story and place the wreck in a broader context. Key archaeological evidence located at the site tells the story of this harrowing disaster and its aftermath. “The items left behind by survivors provide a unique snapshot-in-time for January, 1813, and might help us to understand the adaptations that allowed wreck survivors to await rescue in a frigid, unfamiliar environment for almost a month,” said Dave McMahan, of the Sitka Historical Society, the principal investigator for the NSF award. Before its demise, the Neva was famous as one of two vessels that completed the first Russian circumnavigation of the globe from 1803-1807. It later participated in the 1804 Battle of Sitka, a pivotal battle in the Russian struggle for control over the Alaskan territory. After 1808, the ship was in the exclusive service of the Russian-American Company, which was chartered by Tsar Paul I to establish new settlements in Russian America, primarily Alaska, and carry out a program of colonization. Artifacts discovered by the archaeological team in 2014 and 2015—which comprises members from Russia, the U.S. and Canada and includes two U.S. citizens who were born in Russia—represent the everyday tools used by 26 shipwrecked members of the Neva’s crew who survived for almost a month in the winter of 1813 by foraging and gathering materials washed ashore from the wreck. 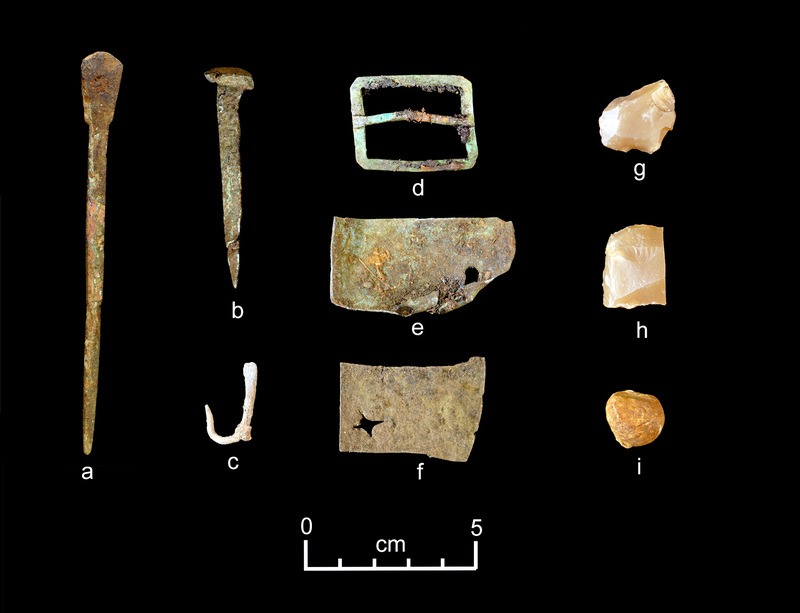 In July, the research team discovered a series of hearths with early 19th century artifacts such as gunflints, musket balls, pieces of modified sheet copper, iron and copper spikes, a Russian axe, and a fishhook fashioned from copper. Well-preserved food middens will allow a reconstruction of foraging strategies the group employed to survive. It appeared that some gunflints had been used as “strike-a-lights” for “flint and steel” fire starting. Physical evidence also indicated an effort to whittle down musket balls to fit a smaller caliber weapon such as a flintlock pistol, possibly the same firearm credited in historical accounts for saving the crew from hypothermia. Some of the copper spikes recovered by archaeologists had been broken from shear stress, as in a shipwreck. One copper or brass artifact is believed to be part of mariners divider’s, saved by a crewman as the ship violently broke apart on the rocks. Because the wreck occurred in an area of profound significance to the Sitka Tlingit, the team did not search for, nor did it inadvertently discover, any graves of those who perished. The Neva came to grief after leaving the Siberian port of Okhotsk for Sitka in late August of 1812. During a grueling three-month voyage, those on board endured water shortages and sickness. Fierce storms damaged the ship’s rigging. In mid-November the weakened sailors finally found shelter in Alaska’s Prince William Sound and, after much debate, made a desperate attempt to reach Sitka. In favorable weather, they almost reached their destination before wrecking off Kruzof Island in January 1813. Fifteen died at sea and 32 perished during the wreck. Of the 28 who made it to shore, 26 survived for almost a month by foraging and gathering materials that washed ashore from the wreck. McMahan said the team hopes to continue the investigation next year with a smaller field effort at the suspected survivor camp. The terrestrial archaeology is only one component of research, which also includes underwater work and archival research. Underwater survey this season was negative due to thick kelp, which obscured the sea floor and interfered with sonar searches. McMahan and Evguenia Anitchenko, the project’s archival coordinator, conducted research in St. Petersburg last September, and plan to do the same in London, where the NEVA was built, later this year. In an effort to put together the most complete story possible, McMahan is also encouraging anyone with information or oral history pertaining to the Neva to contact him through the Sitka Historical Society. “One goal of the research is to replace some of the myths and “lore of the sea” with scientific findings,” he noted. Longer range plans for the project include a “virtual museum” with 3-D scans of artifacts, along with a short film that can be used in local educational curricula. In addition to McMahan (Principal Investigator), U.S. team members include Timothy (Ty) Dilliplane, an assistant professor at the Massachusetts Maritime Academy, and co-Principal Investigator, and Daniel Thompson, an Alaskan historical archaeologist ; Russians Artur Kharinsky, a professor at Irkutsk State Technical University and Yury Lihkin, a scientific advisor with the Taltsi Museum of Architecture and Ethnography in Irkutsk; and Canadians John Pollack and Sean Adams, archaeological mapping specialists affiliated with the Institute of Nautical Archaeology. Two of the team members, Evguenia Anichtchenko, an Anchorage maritime specialist and doctoral candidate at the University of Southampton in the UK and videographer Gleb Mikhalev, an independent film maker from New York, are U.S. citizens who were born in Russia. Sitka archaeologists Sue Thorsen and Brinnen Carter were unable to participate in July, but may join the team for future work. Other participating and consulting organizations in the project include the U.S. Forest Service, the Sitka Tribe of Alaska, the Alaska Office of History and Archaeology, the Sitka Historical Society, Sealaska Corporation, and Sitka National Historical Park. The work stems from a 2012 survey project by the U.S. Forest Service, Alaska Office of History and Archaeology, and Sitka Historical Society. At that time, archaeologists discovered caches of Russian axes at a location predicted to be the survivor camp. During initial planning and information gathering, partners also included the National Oceanic and Atmospheric Administration’s Office of National Marine Sanctuaries, NOAA’s Office of Ocean Exploration and Research, and the National Marine Sanctuary Foundation. The U.S.-Russia Bilateral Presidential Commission has endorsed the project.